Universities offer students a multidisciplinary, creative centered environment. Making creativity one of the most crucial part of its culture, it maximizes the effectiveness of learning and functions as the fuel for ideas. With the diverse disciplines, it comes with different types of creativities. Specifically, the creativity that’s frequently used in the design school is different from creativity for the engineering school and is also disparate from business school’s creative thinking process. This article breaks up the four main types of creativities and purposes the ideal “creativities combo recipe” for designers. It analyzes in detail the type of creativity each discipline offers, from a design educators’ perspective, proposes an alternative solution for design students to hunt and harvest various creativities not only from design school, but also from other disciplines in a university. By using real industry case studies, the article also highlights the importance of the surrounding environment does to creativities, suggests students emerge themselves into other disciplines’ environment to absorb their creativity. Human, the most evolved species, dominates the planet by having exceptional skills such as the use of language, the ability of complex reasoning and the ability to solve difficult problems. Being able to create a unique solution for problem makes human survive. Human thrives on creativity, and creativity thrives on novelty. We are gifted with such a powerful asset which contributes to the creation of some of the most spectacular art and sciences achievements in the world. Among all the factors that influence one’s creativity, atmosphere and environment play a significant role in the league. In Article “How the environment impacts creative thinking”, the author Major Tian mentioned an experiment she did which examines the relationship between personal environment and creativty. They selected two groups of people and place them in two different environments to measure their creativity differences, they have collected a consistent numerical result presenting that various environments scenarios affect peoples’ cognition and behaviors. Some of the environment cues include sound, color, temperature, lighting, and space; the results show that the environment brings a significant influence on how human’s brain work and function. Not only has the right atmosphere enhance one’s creativity, Getting into a new environment and adapting to it can also do the trick, one study done by Professor William Maddux showed the creativity could be greatly boosted when individuals spend time living and immersing himself in a foreign and unfamiliar environment. He conducted a study in which they placed the candidates in a one-to-one buyer and seller negotiation situation, with the knowledge of if the candidate had the experience of traveling or living aboard, they were able to conclude with a result that for the candidate who had traveled aboard, indeed, have the high likelihood of creative deals being reached. The result shows the change in ones living environment can stimulate one’s creativity. Other than the surrounding atmosphere, creativity can also be influenced by creative people one surrounds himself with. Many tech giants are utilizing the freedom created by the open office to foster a creative centered environment for employees. Companies like Facebook opened the world’s largest open-office workspace in Menlo Park, when employees from different field of studies are brought together to solve problems in a group, people from different background influence each other as well as bring different information, creativity, and perspectives. “Collaboration plays a critical role in scientific creativity” says Jian Wang from the Georgia Institute of Technology, in paper “Collaboration and creativity” from research, she explained the how creativity could be boosted by following the collaborative creative process. “Scientific creativity requires divergent thinking to generate a set of novel ideas, convergent thinking to select the best alternative and coordinated action to implement the selected ideas.” Both the surronding atmosphere and creative people do influce one’s creativity significanttly. The paper firstly illustrates how creativity are being taught in design schools in modern days, while other schools are exploring different creativity from other disciplines. It explains the fact that one’s creativity can be majorly affected by the environment and people’s behavior. 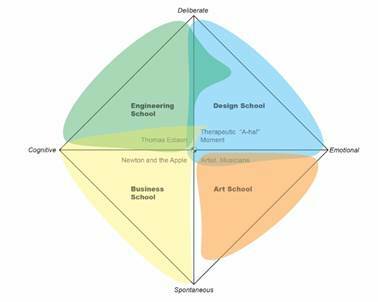 And then, by displaying human’s four types of creativity, the paper categorized the creativity types into different educational disciplines, engineering discipline, business discipline, art discipline, and design dripline. Taking data from the case studies about the gifted children’s drawing, it is clear that different discipline have their own unique way of doing creative work. In detail, the paper talked about the creative technique that are being used by students from different discipline, and the benefits for design students if other disciplines’ creativity are adapted into the design process. In conclusion, the paper makes the proposal for design school to encourage students to explore other discipline’s environment and learn their creativity. 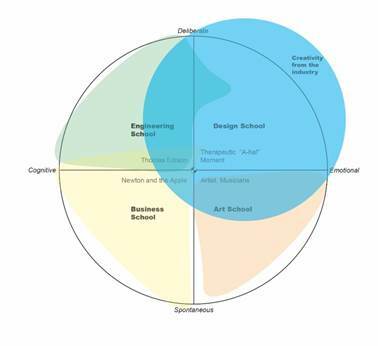 The engineering schools are implementing design thinking into their process; business schools are thinking more entrepreneurially; while other schools in the university are undergoing the reinvention, reformation to promote cross-disciplinary creative learning, design schools still focus on pounding the fundamental design skills into students rather than guiding students’ creative thinking. Some might argue that it is important for students to focus on the basic principles to build their sense of design. First, they need to broaden their library by acknowledging the lines, shapes, points, hues, and textures in design. However, it is possible for students to acquire knowledge of design fundamentals while maintaining the creativity. In the article “Can Creativity Be Taught?” the author picked John Maeda’s (former president of Rhode Island School of Design) mind on creativity education, he stated, “I would not say it can be taught in the normal sense of adding knowledge and wisdom to someone. I would say instead it can be re-kindled in people — all children are creative. They lose their capability to be creative by growing up,” He believes creativity in a child, “is the ability to diverge. In a productive adult, it is the ability to diverge and converge, with emphasis on the converging.” Professor Maeda explains how most kids are born with a strong sense of creativity and as they grow and gain more experiences they tend to lose them. Design students complains about having their creativity constrained, since environment can majorly impact peoples’ creativity, instead of limiting students at one space, design schools should promote the creative thinking by letting student loose to explore another part of the campus to harvest their creativity. Utilizing other discipline’s space to do creative exploration. Creativity is not one dimensional; different disciplines tend to practice a different type of creativity. Modern psychologists were able to categorize it into four quadrants. In the document “The 4 Types of Creativity” by Dr. Rishaquiem, he stated that “Creativity can either be emotionally (based from the heart) or cognitively (thoughts, logical an intelligence) based, and can also be spontaneous (something unexpected) of deliberate (conscious effort to sustain).” In the same document, he laid out the four types of creativity are: The Thomas Edison quadrant which are cognitive and deliberate, The therapeutic “A-ha!” quadrant which are deliberate and emotional, The Eureka quadrant which uses cognitive and spontaneous ability of human. The our hard-to-find Epiphanies quadrant (aka. Artists and musicians quadrant) which are emotional and spontaneous. Different characteristic of people and their disciplines stimulate different creativity, and it goes without saying that it would be beniftial for one to learn about all types of creative thinking process and use them during a creating session. 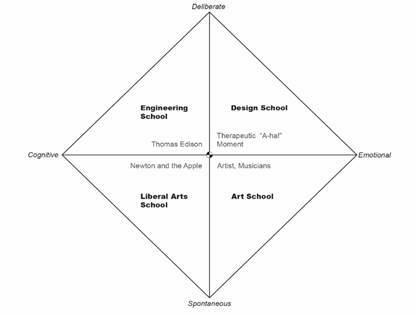 The four quadrants of creativity can also be categorized and matched up with the educational specializations currently offered inside of a university environment. Hypothetically speaking, engineering school represents the combination of deliberate and cognitive creativity, design school uses a deliberate and emotional type of creativity. While students from business school use cognitive and spontaneous creativity in their process, art students tend to use their spontaneous and emotional creativity when creating artworks. It is easy to see the similarity between certain creativity characters with educational specialization in school, for example, the traditional engineering mindset requires engineering student to have the cognitive and deliberate side of creativity. Besides the excellent analytical skills, engineers are known for their hierarchical and formal culture. Engineering schools push students’ ability to think logically, using intricate sciences, they make sense of composite systems in the world. Olesya Blazhenkova from Sabanci University and Maria Kozhenvnikov from the National University of Singapore did a study, they suggested one’s spatial visualization ability can be related to his scientific creativity on the team-level. The scientific creativity mentioned here refers to the cognitive creativity. 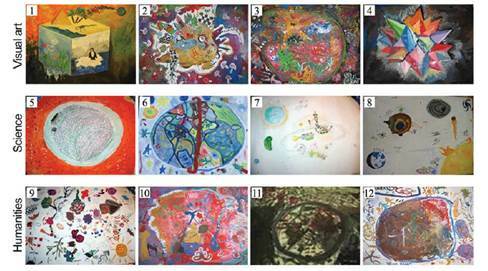 In the study, 82 gifted adolescents from Russia were divided into four teams: visual art team, science team, the humanities team, and a mixed team. All students were given a large piece of poster board and various drawing materials, and they were told to imagine and illustrate an unknown planet within a certain amount of time. The result represented by the four teams are significantly different. All the planet drawings from the scientist's team seem to follow the natural round shape of the planet, the shape and materials are presented similar to how the planets are portrayed in their textbooks. Although they were provided with various drawing utensils and mediums, all the scientist team insisted on using pencils and minimum color to present the clear and unambiguous representation of their imagination through drawings. Interestingly, the study conductors found that within the scientist teams, the team who has biology focused students created a drawing that represents planet with clear sign alien living things based off of human figure; while the other two teams created drawings with no clear sign of life. The spatial compositions and object properties (materials) of the planets are all presented in a creative and unconventional science fiction way, while they all somewhat relate back to realistic cosmic objects or their past knowledge. The cognitive and deliberative character of scientist students’ creativity gives them the ability to imagines things using their spatial visualization. Their spatial visualization ability gives engineering students a unique perspective of viewing objects in life, their cognitive creativity is hugely influenced by that. Don Norman believes designers should head to engineering schools and pick up some technical skills; he said because design school hires a specialist to train students, students often times narrow in on their specialty. Don encourage the school to reform and let the student gain an understanding of technologies from other departments. Environmental impact on ones’ creativity is huge; it forward thinks for students to explore and emerge themselves within an engineering environment. Additionally, he thinks it is perfectly fine for students to have shallow but more board general knowledge. Tying this back to one’s creativity, Don expresses that he believes students should know something about everything, knowing the way to consult the world’s specialists, to communicate cross creativity, to convey thoughts through products and services. While Don encourage students to get a grasp on the knowledge from different field of study, design student can also learn different creative learning methods by engaging in other disciplines. Step 1 – Preparation: Recognize the problem and find out as much about it as you can. Consciously try to come up with an answer. Step 2 – Incubation: Do something unrelated to the problem, think of something else and allow your mind to work on the problem unconsciously. Step 3 – Illumination: It is during the incubation period that an unrelated event could answer, a sort of realization, an illumination. Step 4 – Verification: At this point, you check the solution you have come up with to see if it will work. It is admitted that the adopting a various creative process would be extremely beneficial. And design schools could very well take advantage of this when doing ideations, by following through the steps, students are able to explore a distinct way of creating things. Other than having the creativity to keep up with the latest trend in the market, communication is also one of the business students’ specialty. It is the act of conveying meaningful information from one party to another through verbal or visual language. Being able to think critically and communicate through effective dialogue is what design students need to pick up from business school. Because collaboration is becoming the inevitable driver for future businesses, being able to exchange one’s idea is crucially effective. Collaboration is business students’ second natural, picking peoples mind and talk through the problem is how they operate, in any team creative session, they push towards the goal together instead of separating the thoughts. Overseeing the big picture, business students become good at thinking critically and working with teams. They combine their statistical concept with liberal art background in many subjects; business students have a strong foundation that allows them to fit into a wide variety of careers. In the article “Mark Rothko on How to Be an Artist” the author mentioned, “Famed Abstract Expressionist Mark Rothko believed that art was a powerful form of communication.” He believes that artists should be able to express the inexpressible, he goes, “Indeed, Rothko emphasized that “the most interesting painting is one that expresses more of what one thinks than of what one sees.” Likewise, he placed great weight on abstraction’s ability to convey what is most important to humans—not the world around them, but their emotional life.”. The visual artist uses their work to express their creativity, and it is undeniable that the artists always have their way to keep their creativity fresh. The creative process for artists are spontaneous and can be full of personal emotion, from the same “Unknown planet” study done by Professor Olesya Blazhenkova and Professor Maria Kozhenvnikov, it is discovered that the groups with specialization in visual presented the most non-spherical shape for their planets, they tend to explore the possibilities with various shapes and perspectives. Regarding the use of color and materials, the artistic team explores all the possibilities with drawing utensils as well as the color pallets and compositions. The techniques they used were unexpected, and the color they chose was extraordinary. Unlike the drawings done by the sciences groups, when it comes to the meanings that the drawings were representing, there seem to be any ambiguity and misunderstanding and misleading shape between the thoughts and the drawings. According to the document, “the teams of visual artists tended to create drawings rich in object properties (using the complex color palette, color blending, and shades, pictorial detail, complex texture) and did not represent realistic spatial relationships.” The act of visual art can be spontaneous, and artists often use to express their emotions through their works. In this case, designers can also borrow the freedom to express one’s self-creative thinking process. Although they rarely take lessons on creativity from other disciplines, artists have many ways to stimulate their creativity. Design school today requires students to take a limited number of engineering, art and business courses, but by only taking the classes is just scratching the surface of those disciplines. Without collaborating on a project with people from different disciplines, it is hard to observe their way of conducting the operations, therefore, hard to absorb their creative thinking processes. From an educator’s perspective, the goal of creative teaching is to create a responsible environment through teachers’ enthusiasm and appreciation of individual differences. Davis in handbook “Teaching creativity thinking” wrote that establishing a creative atmosphere was essential to stimulate creative thinking in a classroom environment. The environment with high competition but low conflict can significantly boost students’ creativity. Also, it helps to encourage creative and reflexive thoughts through activities. Creativity scores were significantly higher when students were provided with more opportunities to manipulate materials, participate in open discussions and self-evaluation, and engage in self-initiated learning. Creativities that designers need differs from stage to stage in the design process, but for the most part, the designer is equipped with deliberate and emotional creativity. When designers are in the problem-solving stage of the process, the deliberate creativity kicks in and helps the design innovate using the logic and past experiences. The emotional aspect of creativity also plays a significant role; the designer often relies on the innovative thinking comes from emotion. During the research phase, to come up with different data collecting methods, designer can borrow the cognitive and spontaneous creative technique from business school. To effectively convey the ideas, spontaneous creativity helps one to construct the sentence effectively, and cognitive experience hinders designers to explore possibilities from different perspective, it makes students to think outside of the box. The emotional and spontaneous creativity can provide an alternative platform for designers to create during the ideation process, while the deliberate and cognitive creative process from engineering creativity would come in handy when designers are figuring out the mechanical aspect of the product or frameworks for the ecosystems. Using the spatial visualization ability that engineering students mastered, design students can better picture of the objects when experimenting with rapid prototyping; later in the stage, the deliberate side of creativity from engineers would help designers to embrace the story and logic of the product. Due to the students’ age, demographic, and diversity of personality, it is admitted that cultivating students’ creativity while maintaining the same educational standard regarding the fundamental skills in a tough task. A common misunderstanding is the design or art school is the only place on campus that uses creative thinking; the truth is other schools has their unique way of being creative. After realizing that adapting design thinking into their process can be greatly beneficial, many other schools in the university are taking the initiative to learn the process. Design school should also take action, one of the alternative solutions is using the entire campus as a creative resource, encourage students to seek creativity from different disciplines in their space. Environment and influential individuals can majorly affect one’s creativity, by emerging themselves into their environment, freely collaborating with people from different disciplines, design students are being empowered with creativity assets from multiple fields. The full circle creativity distribution map gathers creativity from the whole campus as well as encouraging students to explore the possibilities in the real world, taking advantages of the creative working process from the industry. Creativity is the common language that connects numerous disciplines, it uncovers insights, bridges gaps and solve problems. Having larger overlapping areas on the creativity distribution map would make the collaboration process not only seamless, but also significantly expand students’ creative ability in design. Arieti, S. (1976). Creativity: The magic synthesis. Oxford, England: Basic.